11 Amazing Things to do in Chicago, IL – If you are looking to go for a long week or even for a short weekend trip to Chicago, here are the top 11 things to do in Chicago! Contains the best eats, where to see the skyline, and which neighborhoods to visit! It’s almost been a month since we left Chicago and I’m already missing it bunches. It has taken me awhile to go through pictures, and it was hard to choose only 11 things to do in Chicago, IL because we did so much for only four short days. We thoroughly enjoyed everything Chicago has to offer! One thing I am going to say, Chicago has great food. We ate so much, and I include two of my must-haves! When we first arrived in Chicago, we purchased a 7-day CTA pass to use on the trains and buses. It was the most bang for your buck, and I do not recommend renting a car in Chicago. There isn’t much parking, the traffic is insane, and if you do find parking, it’s expensive. 1.) Millennium Park – It’s a very touristy spot, but it’s something you cannot miss. Millennium Park is located in the Loop community area of Chicago, which is also known as the “front lawn” of Chicago. There are so many activities to do, and we even saw a free classical concert which was pretty neat in the park. Every Monday and Thursday starting June 6th until August 25th they offer free concerts at the Jay Pritzker Pavillion. It’s a great FREE family activity to do. Here’s the schedule of who is performing. While you are in Millennium Park, don’t forget to check out the Nichols Bridgeway which is a pedestrian bridge that connects the south end of Millennium Park with the Modern Wing of the Art Institute of Chicago. I didn’t know where the bridge went as we were walking up it, but it has decent views. Another place I wish we would have stopped at was the Lurie Garden which is located on the southern end of Millenium Park. There is so much to do in Millenium Park you can easily spend a day there. 2.) Cloud Gate “The Bean” – Cloud Gate a.k.a “the Bean” is located in Millenium Park in the Loop community of Chicago. 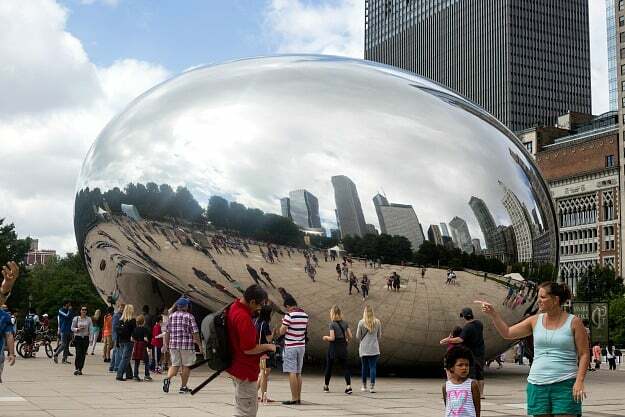 It’s known as the bean because of its shape. Well, it looks just like a bean! It doesn’t look THAT big in the photos or even in person so I couldn’t believe it is 110 short tons! I loved taking pictures of it because it reflects and distorts the city’s skyline. I only wished we visited it during sunset; those photos would have been gorgeous! 3.) Chicago Architecture Foundation River Cruise Tour – I am not a tour kind of gal, and neither is my husband. Instead, we love to research the places we are visiting ahead of time and do things on our own time. However, I highly recommend taking the architecture boat tour. It’s a little pricey at $44 person, but trust me on this. The history you learn about Chicago is priceless and how architecture in Chicago has evolved over time. The tour runs for 1.5 hours and even has a bar on the boat for soda and adult beverages. It’s a tour you will not want to miss! 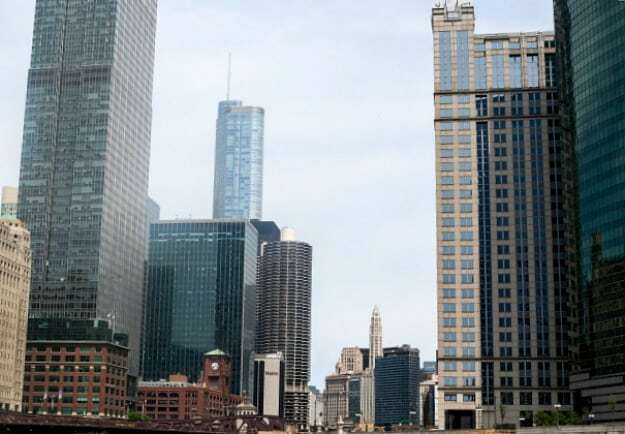 The docks are located at the southeast corner of Michigan Avenue Bridge at Wacker Drive. Be sure to book the tour ahead of time because they sell out fast! We booked ours the day before. 4.) 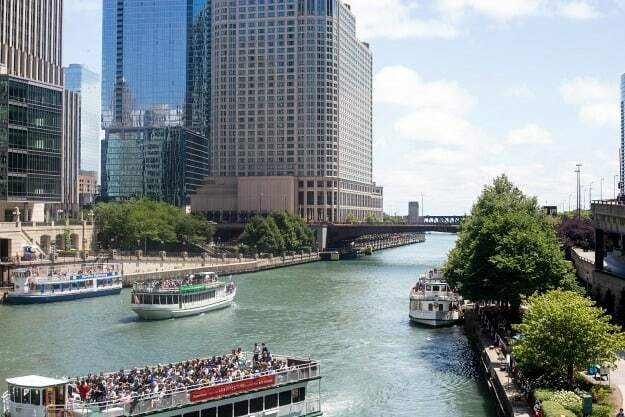 Chicago Riverwalk – While you are booking your tour for the Chicago Architecture Foundation River Cruise Tour I recommend taking a walk down the Riverwalk. The Riverwalk contains many restaurants, seating, and boat rentals. The Riverwalk spans from Lake Shore Drive to Franklin Street. It’s open at 6 AM and closes at 11 PM every day of the week. 5.) 360 Chicago or Signature Lounge at the 96th – If you are looking for a GREAT view of Chicago, I recommend purchasing a ticket for 360 Chicago Observation Deck. You can enjoy 360º views 1000 feet above Lake Michigan and Chicago’s Magnificent Mile. The tickets are $20 for adults 12+ and $13 for youth 3-11. If you only have adults in your party, I recommend visiting the Signature Lounge on the 96th instead for a drink with amazing views. The cocktails are a little pricey, but excellent. The view is free of charge and fabulous! 6.) The Whistler (Bar) – Perfect if there are no children in your party. We stopped, and I had a Magdalena cocktail, which was fantastic, and my hubby ordered a beer. I thought the atmosphere was amazing, and the place was tiny. I loved it, and the hubby didn’t. It was too small of a place for him, but for me it was incredible. Be careful not to go past it, we did. It’s located in the Logan Square community of Chicago. 7.) Revolution Brewing – I am a craft beer gal and cannot get enough of it. Of course, I had to stop by one of Chicago’s best breweries! Make sure to stop at the brewpub instead of the tap room for a brewpub atmosphere. If you are looking at taking a tour, then definitely go by the tap room. I loved all of their beers and hubby’s favorite was the ANTI-HERO IPA. We later found out the ANTI-HERO IPA is incredibly popular and served everyone. It’s located in the Logan Square community of Chicago. 8.) Wrigleyville – If you are looking for a sports neighborhood, I cannot recommend stopping in Wrigleyville. Be sure to catch a baseball game while you are there! 9.) Navy Pier – We spent a lot of time at the Navy Pier because we later found on later they were doing live music and fireworks to celebrate 4th of July the day before. So really we spent almost two days there. So the Navy Pier is a 3,300-foot-long pier on the Chicago shoreline of Lake Michigan. There are so many restaurants, places to shop, and even a funhouse maze. We didn’t get to visit the funhouse maze because it was packed! Next time we will have to go. You can also book many and I mean many boat tours here. We didn’t do any more tours because we loved the architecture so much. If you are looking for a great view, I cannot recommend going on the Ferris wheel enough. It’s located Streeterville neighborhood of the Near North Side community area of Chicago. 10.) 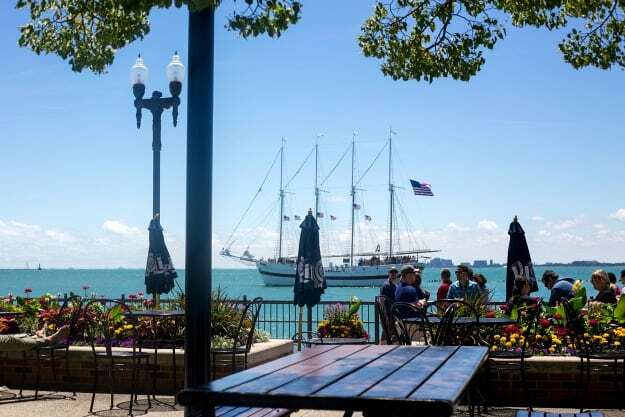 Beer Garden – While you are visiting the Navy Pier, take a short walk down the end of the pier, and you will find a beer garden. We enjoyed having a few beers with the gorgeous views of Lake Michigan. They have a great selection and aren’t too expensive, about $7-8 per beer. 11.) Giordano’s Pizza – You cannot go to Chicago and NOT have Chicago’s famous deep-dish pizza. I did a lot of research before our trip to find the best deep-dish pizza and this place is legit. I will have to warn you, though. This place is packed! And that’s an understatement. We waited in one line to add our names to the waiting list; then we had to get into another line to order our pizza because the pizzas take a 1 1/2 hours to make. They have everything down to a tee because we only waited 15 minutes at the table before the pizza arrived. It was incredible! We ordered a small and we took two pieces back to the hotel with us. We were stuffed! They even have to go deals for taking a pizza on the plane! It was the best pizza I have ever had. As I started to edit this, I noticed I didn’t have enough room to add my favorite place for tacos – Mercadito. They are known for their guacamole, but their tacos are amazing. When we stopped I ate them so fast I wasn’t able to take a picture. We were hungry! So this post should now be titled 12 amazing things to do in Chicago, IL instead of 11. I’m going to stick with 11 because it has a theme with my 11 Amazing Things to do in Charleston, SC!